Driving up South Korea’s “freedom highway” north of Seoul, just after the turn off for the National Defense University, observant travelers will notice a collection of transmitter masts off to the right of the highway. At first glance, the site looks like it might belong to a major broadcaster like KBS, but the truth appears to be much more interesting. Seeing inside the site is impossible from the highway, but a neighboring hill provides a good outlook, as shown below. The site contains 16 transmitter masts, all but one of which are contained in a large field. A single mast sits in the middle of neighboring greenhouses. On the north side of the facility (the left side of this picture) are a series of buildings. These almost certainly house the transmitters that produce the signals that are piped to the masts. As can be seen in the above picture, the site is surrounded by a high fence topped with barbed wire. There’s also a guard post at the edge of the facility where the road enters. 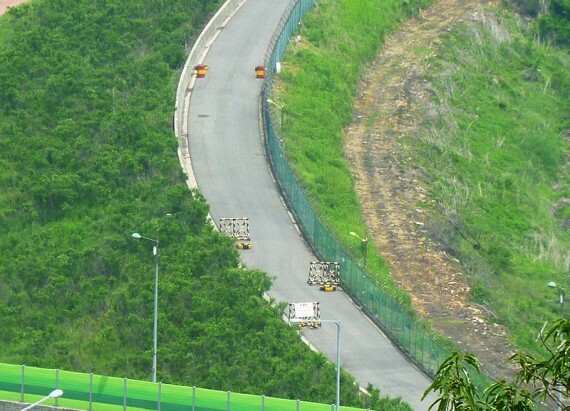 The road itself contains barriers placed to slow approaching traffic and notices to motorists. 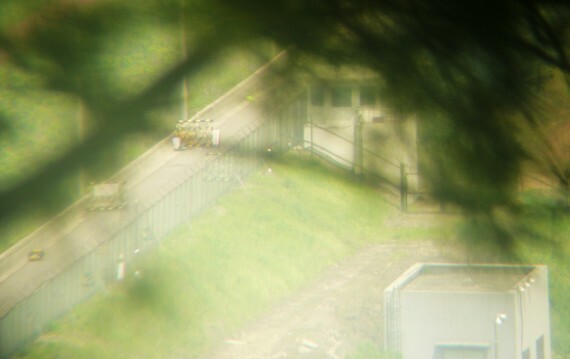 The fences, guard posts and road blocks all point to the facility being somewhat sensitive. The main KBS shortwave transmitter site at Gimjae in the south of the country doesn’t have the same level of security. Neither does an MBC transmission facility a little further north along the highway. 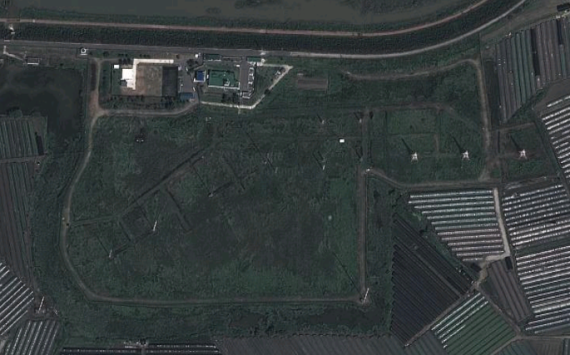 The sensitivity of the site is confirmed with a check of satellite pictures of the field. The transmitter masts and buildings can be easily seen. 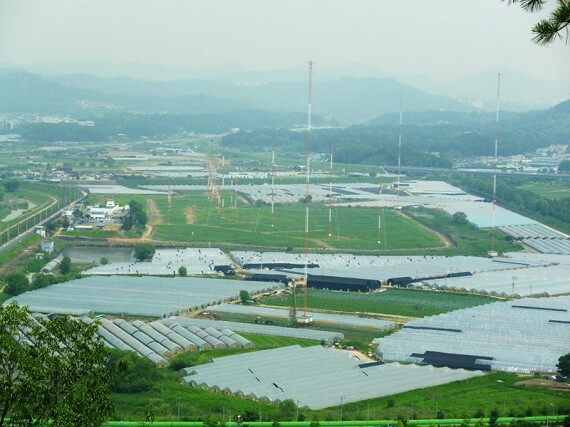 The image on Daum, a South Korean portal, has been altered so that none of the transmitter masts or buildings appear. It hasn’t been done perfectly — a few of the shadows cast by the masts can be seen — but it’s a pretty effective effort at removing any details of the facility. South Korea routinely edits satellite pictures of military installations just as it restricts digital maps of areas near the border, so this is pretty close to confirmation that the radio facility is a sensitive government facility. But what is it used for? For the answer to that, a radio provides a clue. Among the roughly dozen shortwave radio stations that broadcast to North Korea, there are two that don’t have websites, they don’t have listings and can’t be found in official literature. “Voice of the People” and “Echo of Hope” have been on the air for years, broadcasting an anti-regime program that goes further than other stations in attacking the North Korean government and leadership. Both stations have long been assumed to be run by the National Intelligence Service and are heavily jammed by North Korea. The North Korean jamming, which involves broadcasting a very powerful noise signal on the same frequency, makes the South Korean stations difficult to receive. It’s is so powerful that it even overrides their signal on radios in Seoul, across the sea in Japan and even in the United States. In comparison, here’s what it typically sounds like anywhere away from this location. The following file was recorded in Seoul. The conclusion? 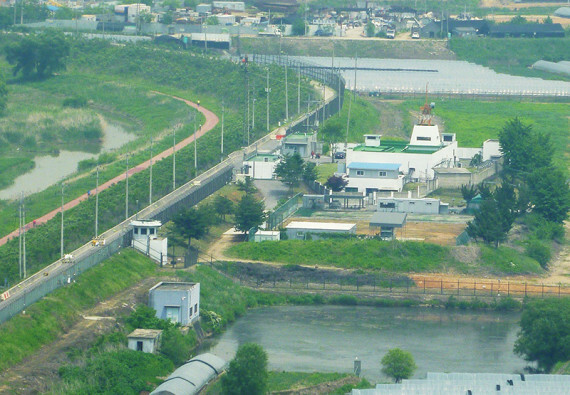 The transmitter site is almost certainly the base from which the South Korean government broadcasts the “Voice of the People” propaganda station towards North Korea. It’s worth noting “Echo of Hope,” the second propaganda station, was received poorly at this location. That means that it probably comes from a different site. Could cross-border propaganda radio fall silent with summit agreement? 4 Comments on "Is this a South Korean propaganda radio station?" Could this function as an NIS numbers station as well? Technically, I believe it could do. I think you’re referring to V24, right? I don’t know if anyone has ever done any work to try and determine the exact location of that station. Fantastic story – Thanks for posting, its articles like this that make the NKTech blog weekly essential reading for me. This is obviously the facility literature calls Goyang or Gyeonggi-do. So far it was just believed that it is the origin of the “Voice of the People” transmissions. Hereby this has been confirmed. 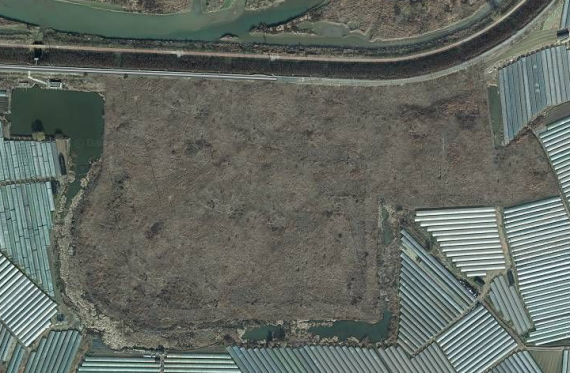 Btw, the recently closed MND Radio was believed to be transmit from either or both the Hwaseong/Jeongnam facility or yet another one, Chungcheon at 37° 56′ N, 127° 46′ E.